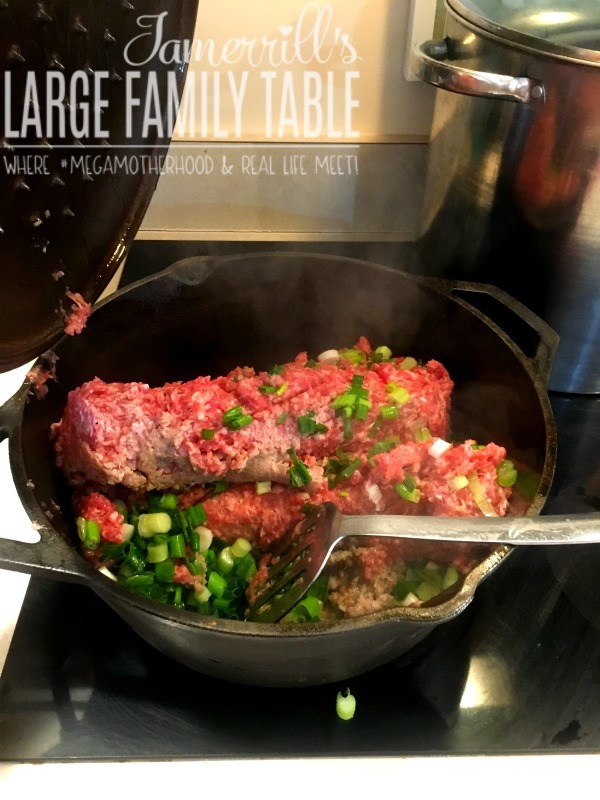 Well, the first victory of my most recent large family freezer meals prep day is I’m publishing this freezer meal prep post just two weeks after I got all this large family cooking done! Aren’t you proud?! I think this is a Jamerrill Freezer Cooking first to have a pretty decent turn around on my actual cooking and sharing the freezer meal results online with you. Honestly, though, the only reason this has all pulled together more quickly than usual is I’ve busted my neck again, sigh ( shared about it here and here on Instagram). I’m on several days of bed rest with multiple chiropractor adjustments. This is where having a stocked freezer is such a blessing for the unexpected. The family has been able to just open a box of salad and pull dinner from the freezer even though I’ve been down for the count. 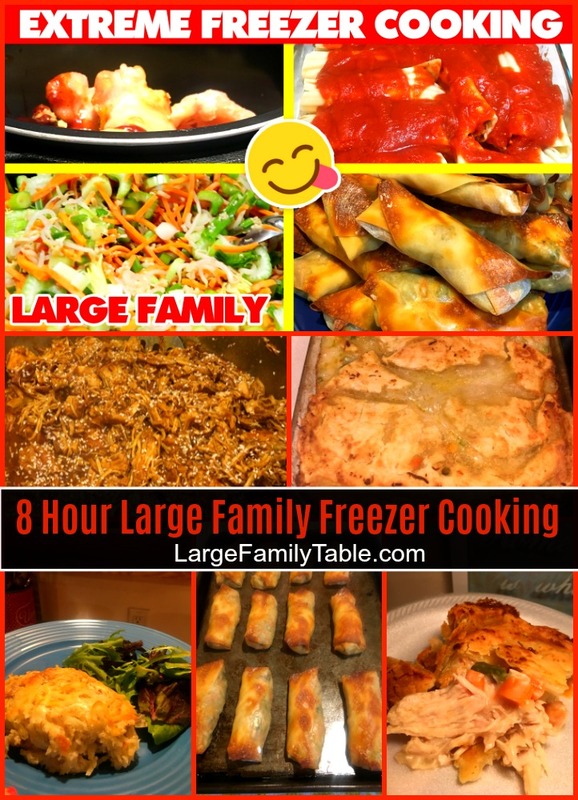 Similar to my big freezer meals prep day in April 2018, in June I took about 8-hours on one day to get all I could prepped and even completed three full freezer meal recipes. I got started freezer cooking around 1:30 pm and finished up around 9:30 pm. I always feel a need to brain dump my freezer cooking plans onto my trusty kitchen whiteboard. So I broke down what I wanted to accomplish in about 15 steps on my whiteboard list. 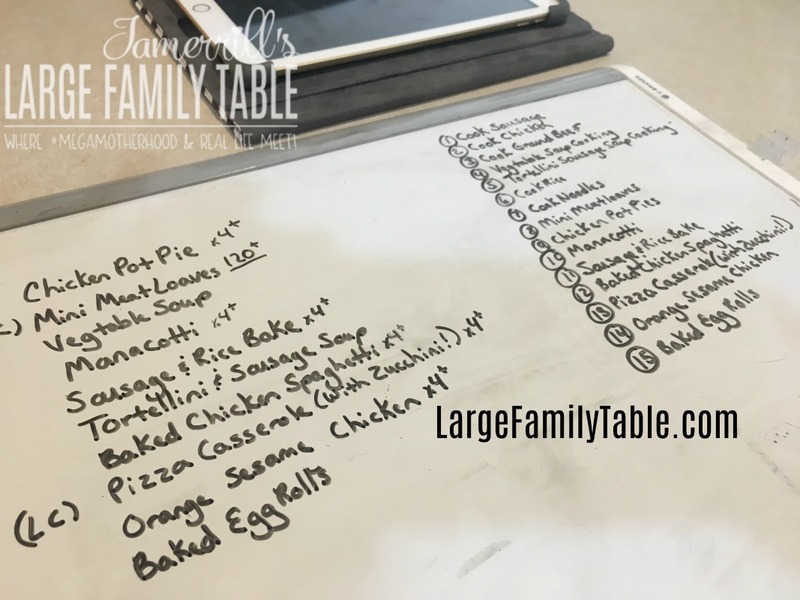 You can see the full 15 steps on my whiteboard list in today’s new large family freezer meals prep video. My whiteboard freezer cooking plan gives me a running list to keep myself on track. I like to get all of this done over two days. As you know, some of my freezer cooking days can be two mostly dedicated days, but then with family needs and life, I might have to finish my last few meals here and there over a few pockets of time within mini freezer cooking sessions. That wasn’t the case for making freezer meals in June. When this happens though I just keep “doing the next thing” on my whiteboard until my freezer meal plans are completed. On day one of my freezer cooking, I completed numbers 1 through 8! On day one I completed batch cooking 30 lbs of chicken and 15 lbs of ground beef in my electric pressure cookers. I also cooked 9 lbs of ground sausage in my cast iron dutch oven for various large family freezer meal recipes. Then I cooked manicotti noodles and rice in bulk. In between all the once-a-month cooking that I mentioned above I prepped and cooked over 120 Meatloaf Minis. 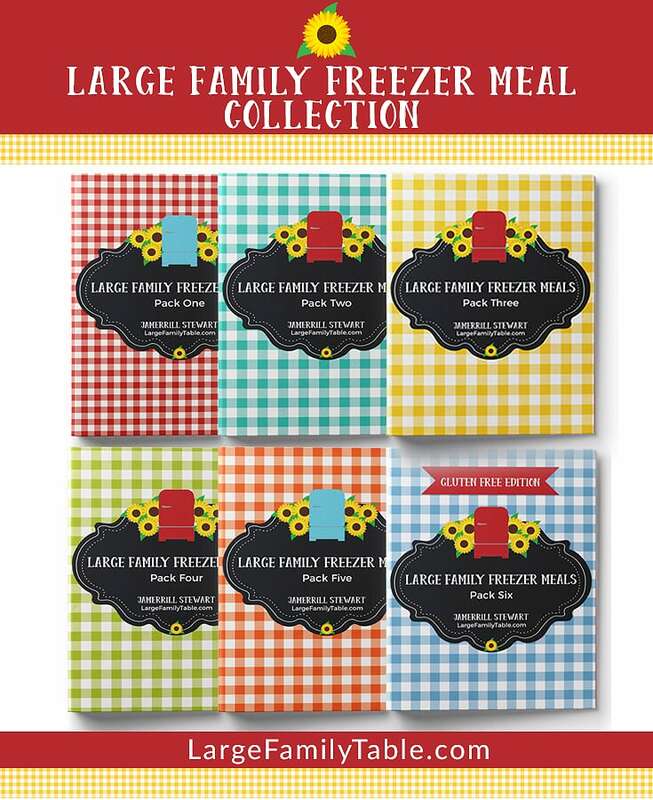 These little cuties are so convenient to have in the freezer for homeschool lunches or even large family dinners. On this freezer cooking day, I served the kiddies these mini meatloaves with cottage cheese and carrot slices outside on the deck. They were a big hit as always! I don’t cook these with ketchup, but the kids can add BBQ sauce or ketchup to their mini freezer meatloaves with their meal. 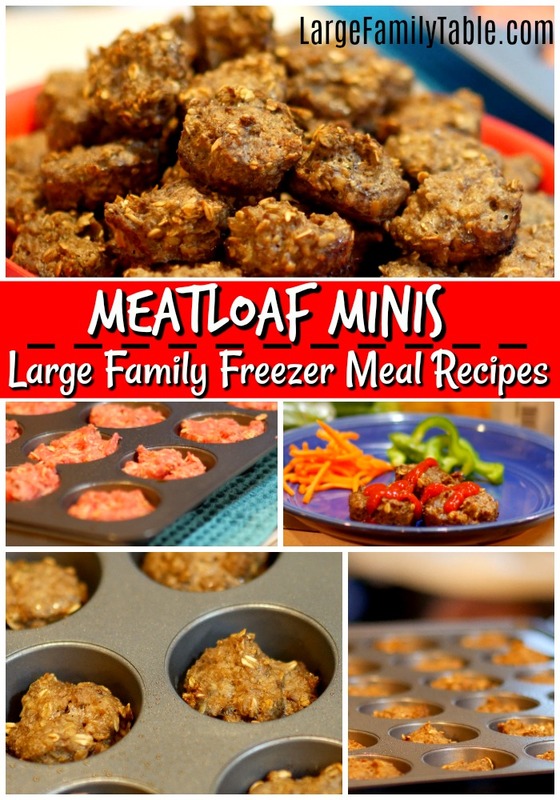 You can click here for the full Large Family Mini Meatloaves Recipe! Once I had my Meatloaf Mini assembly line action in place, and I had the first 48 in the oven, I moved onto getting a huge pot of Quinoa Tortellini Sausage Soup cooking. I had a big bowl of this soup from the freezer today and it is so incredibly good. 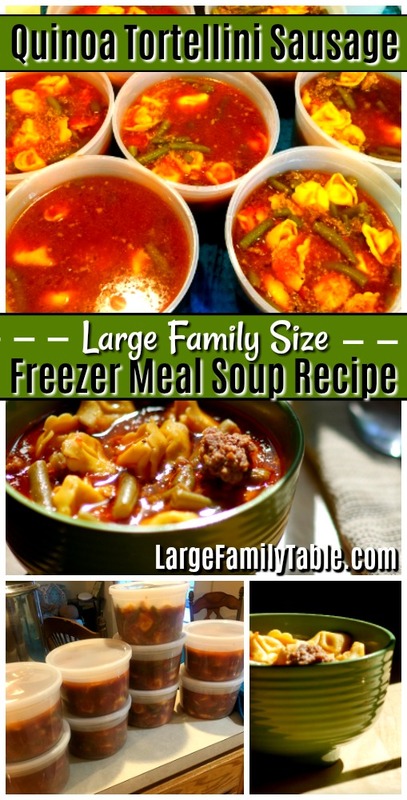 Click here for the full freezer meal soup recipe for the Quinoa Tortellini Sausage Soup. Once all the meat, noodles, rice, meatloaves, and Quinoa Tortellini Sausage Soup was cooked in bulk and put away, I made one more huge pot of soup for the freezer. This last push was for a big stock pot of Vegetable Beef Soup. The freezer containers I ordered from Amazon worked well. 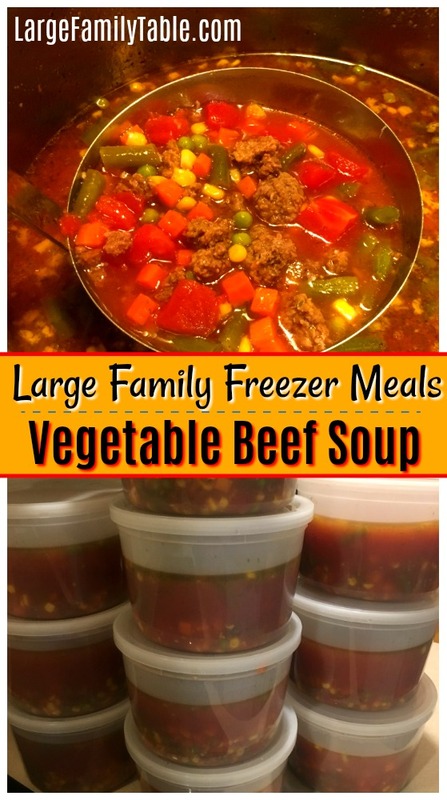 You can click here for the full freezer meal recipe for Vegetable Beef Soup. 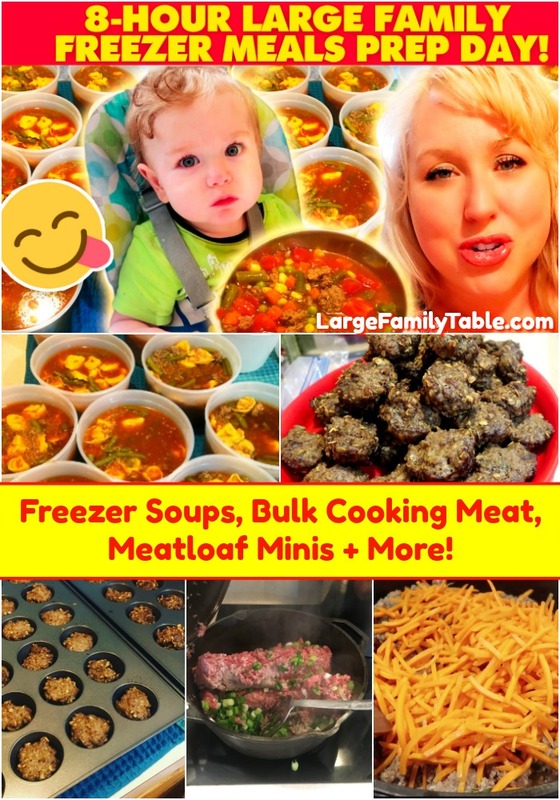 Click here to watch the full 8-Hour Large Family Freezer Meals Prep Day | Freezer Soups, Bulk Cooking Meat, Meatloaf Minis + vlog on YouTube! Once the full 8-hour large family freezer cooking day (and for me that 8-hours includes nursing baby breaks, meal serving times, clean up, and more) was complete I headed to bed to eat a pint of Halo Top light ice cream and watch House Hunters, my little momma treat to myself – because mommas need some treats, too. I’ll share all the wild adventures of my freezer cooking day two in just a few days so be on the lookout for that post and video. 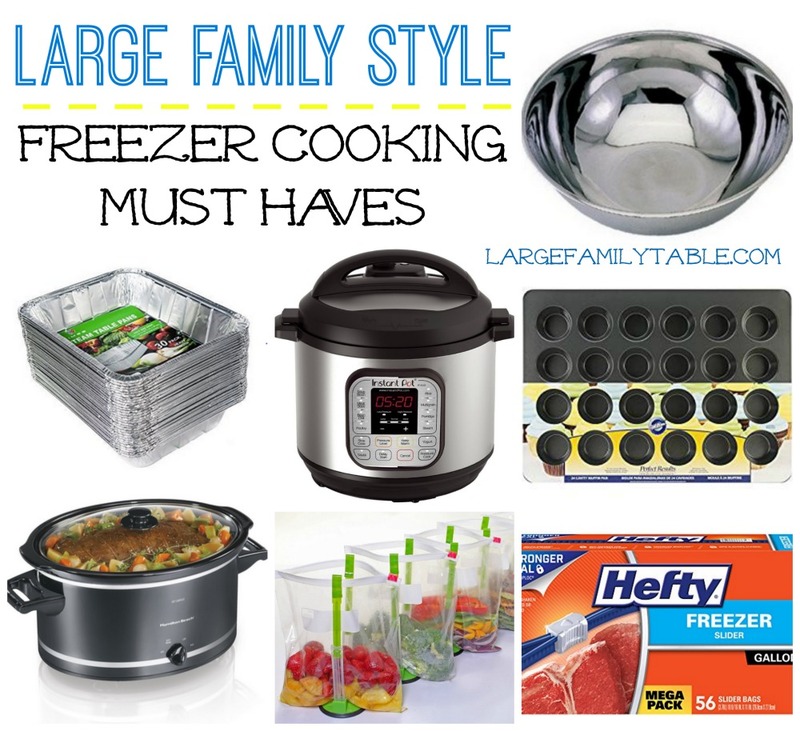 In the meantime be sure to share in the comments what you’ve been cooking up for your family’s freezer! Click here to see how my day two EXTREME freezer cooking day worked out! Thank you for all of the freezer cooking meal ideas. I’m pregnant with #4 and have been making a long list of meals to prep for my maternity leave. I will be testing out all before I actually get close to having baby only 13 weeks lol. Frozen buritos, mini pizzas and cheesy broccoli chicken rice were on my list now I’m adding veggie soup and the mini meat loafs. Last go around I thought we were prepared meal wise but sadly fell very short. I ended up having to go grocery shopping (just days after birth) and we ate a lot of fast food and frozen burritos from the store. I may do a version of tortillini soup since it sounds yummy. I always love your posts and how graceful you are. Get better soon. What a blessing to share how you accomplish this! Thank you for your time and ministry! I would like to know more about your cast iron dutch oven! How big is it?